The black bean brownies were an unexpected hit, so I thought I'd throw another quirky recipe in your direction. Actually, I'm having a hard time deciding whether to tell you about the Heavenly Pie first, or the book it came from - both are refreshingly unique and outstanding in their own way. So, how about a bit on each? 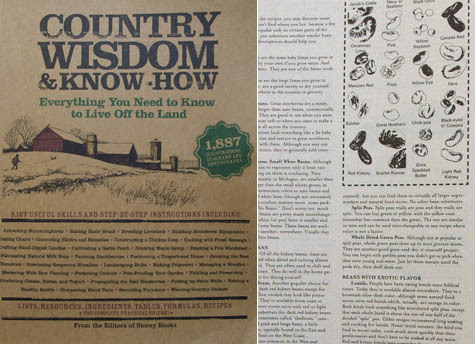 The book is called Country Wisdom & Know-How: Everything You Need to Know to Live Off the Land. I stumbled on it while browsing the stacks of a SF bookstore when its unique (read: giant) format and design caught my attention. With high hopes, I flipped straight to the jam-packed recipe section where the Heavenly Pie greeted me as black text on newsprint paper. I made it, we ate it, and subjected everyone who had a slice to the "guess what's in it" game. Imagine a honey-sweetened graham cracker crust filled with a cream cheese chocolate filling. Sounds pretty typical, but here's where it gets interesting. The recipe calls for equal parts tofu and cream cheese in the filling. This combination creates a decadent, mousse-like texture that's also a breeze to cut into precision slices. It wasn't overly sweet, and the buttery crust played off the light chocolate flavor beautifully. "...Back in the 1970s, during the "back to the land era" when hippies were homesteading and gas and energy prices were sky high, Storey began to publish a series of small booklets called Country Wisdom Bulletins, each one addressing a bite-sized piece of country know-how, a simple skill, some knitty-gritty information. The collection of bulletins grew into the hundreds and eventually over 15 million copies were sold to people eager to discover the fun and satisfaction of doing more for themselves..."
Spanning nearly 500 densely-packed pages, an impossible amount of information is shoe-horned into this book. The major sections are Animals, Cooking, Crafts, Gardening, Health & Wellbeing, and Home. It drills down from there. For example, in the cooking section the major sections are General, Breads, From the Dairy, Meats, and Preserving, Pickling, Canning, Distilling. If you follow the General section you'll come across blocks of content like Cooking with Dried Beans, Fast and Easy Way to Cook Vegetables, Salsas!, Cooking with Yogurt, etc. The bread section delivers dozens of bread recipes - banana bran bread, cheddar dill bread, custard corn bread, savory pumpkin bread, and apricot almond bread, etc, etc. As far as formatting goes, for better or worse, recipes rarely span more than a few inches of column space which on one hand makes them seem approachable. At the same time, there isn't much hand-holding involved for those who like recipes to tell you what to look and watch for throughout the process. Country Wisdom's large format makes it a perfect coffee table book. Friends will leave your house knowing how to, say, make a C-clamp Flower press, plan a vineyard, design a hummingbird garden, brew a virus fighting tincture, or build a drystone wall. Thousands of delightful, informative black-and-white line drawings and diagrams sprinkled throughout the Country Wisdom add to the content and pacing of the book. The Heavenly Pie was absolutely delicious. That being said, I'm not sure how the rest of the recipes hold up or where they were originally sourced. Many look great at first glance, and for those of you looking for 'natural food' type recipes, the ingredient lists here call for lots of whole grains, wheat flour, yogurt, natural sweeteners and the like. As was the case with the pie, you may need to make some on-the-fly tweaks (for example, I had extra filling), but with a bit of culinary know-how, and some flexibility on your part, the recipe section in this book is well worth the $19.95 cover price (I see it is $13 on Amazon). Adapted from Country Wisdom and Know-How. Instead of running this recipe verbatim (like I normally might), I've tweaked a few of the ingredients, added some notes. Serve this pie well-chilled. To make the crust make combine the cracker crumbs, butter, and honey. Press into a 9-inch pie pan. I gave this mixture a whirl in the food processor to bring it all together and work out and chunks of cracker. In a food processor, or with the mixer at medium speed, blend together the cream cheese, tofu, egg, chocolate, and vanilla. Scrape down the sides once or twice. Blend until filling is very smooth, with no visible lumps. Spoon the filling into the pie pan and bake at 350F degrees for about 30 minutes (when I went to 35 minutes I started seeing fissures in the filling). CHILL COMPLETELY BEFORE SERVING. Serve with a dollop of sweetened yogurt or whipped cream (if desired). Makes one pie. About 12 servings.